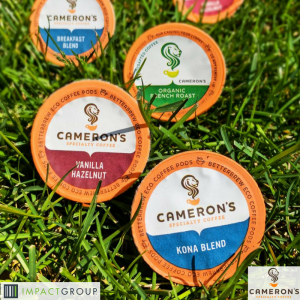 Impact Group is thrilled to announce that we will be providing retail brokerage services to Cameron’s Coffee, a specialty coffee brand that strives to also be fairly priced. Cameron’s Coffee produces coffee using 100% specialty-grade Arabica beans, chosen from the top 10% of beans in the world, hand-crafted to perfection. Their Roasters’ expertise brings out the smooth, complex flavors without the bitterness of over-roasting. Over the past year, Cameron’s has been and continues to be one of the fastest growing brands in their category. Their ecopods are also the fastest growing single serve option nationally, as key retailers support non-plastic options. Impact Group is committed to building brand equity for Cameron’s and will provide strategy and joint business planning as we market Cameron’s products through conventional, specialty, and natural retailers. We are ecstatic to welcome Cameron’s Coffee to our portfolio of top-notch brands!